In the end of February, 2012, we bought a Prius. My wife’s car was old, had a zillion miles on it (OK, 200,000…) and it was just time to be replaced. We started looking around to see what was out there, what we could afford, and what would make a good family car for a number of years to come. My wife really just wanted something with an automatic and air-conditioning. I wanted something that was high-fuel-economy, or possibly alternative fuel. 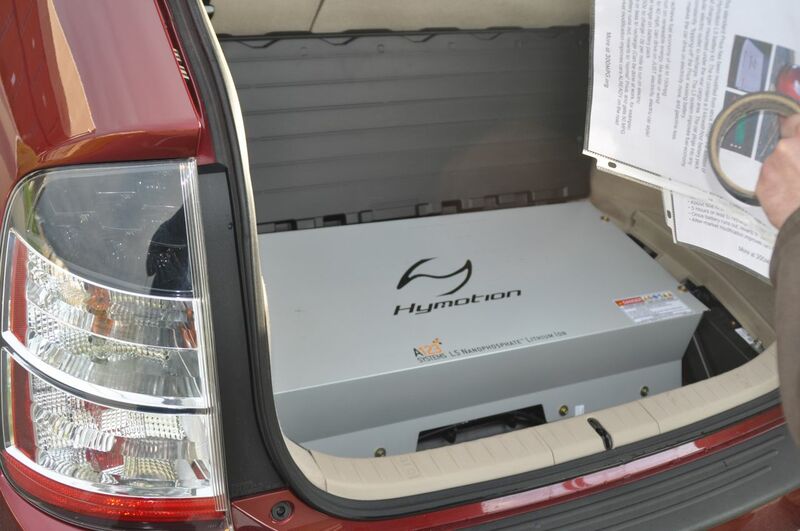 I started pestering all of my friends and asking around, and eventually got a lead on a 2004 Prius with a Hymotion aftermarket plug-in kit already installed. The seller was a good four-hour+ drive from where I lived, so it would have been a whole day just to go see the car. Instead of doing that, we communicated by e-mail for photos of the car, the features, the price, etc. It all looked good. When I first heard about the car, I figured there had to be a catch – must be a really ugly color or something. Nope, it was a nice dark metallic red, with tinted windows even! With that it was time for a road trip to go get the car. My buddy Tim agreed to drive me down there. 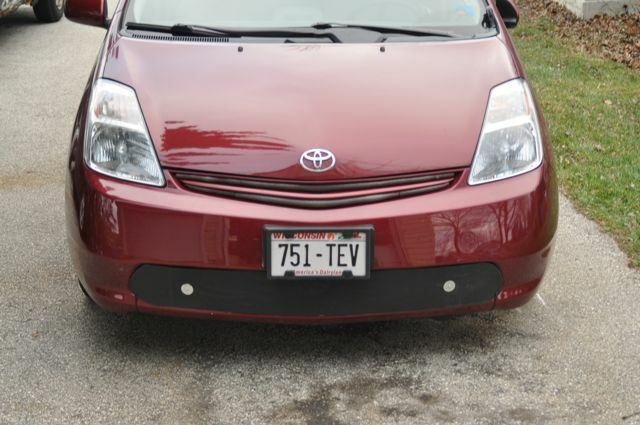 He had a black Prius with an Enginer brand after-market plug-in kit on his car. We piled-in one morning and headed towards Peoria, Illinois. It was fun seeing wind-generators lining the interstate on part of the trip down. Very soon, my wife’s car would be running partly on electricity created from wind-power. We missed a turn on the trip down. That added about an hour to the trip. Oops. We finally arrived at the sellers’ and got to see the car. It was nearly perfect. Spotless interior and exterior, HID headlights, keyless entry, and even a heated driver’s seat! Of course I didn’t even have to look at the car. I could just look at the sellers garage. The floor was painted white – and it was SPOTLESS. His wife’s car was parked in the garage. It was NOT the latest model, but looked like it was right off the show-room floor! This guy knew how to take care of cars! The trip back home seemed a bit longer, as I was now driving all by myself (and it was dark too.) When we stopped for dinner, I talked with Tim about any of the odd things I noticed about the Prius. I had never driver one that much before this. Fuel economy for the first 30 miles was pretty amazing though! 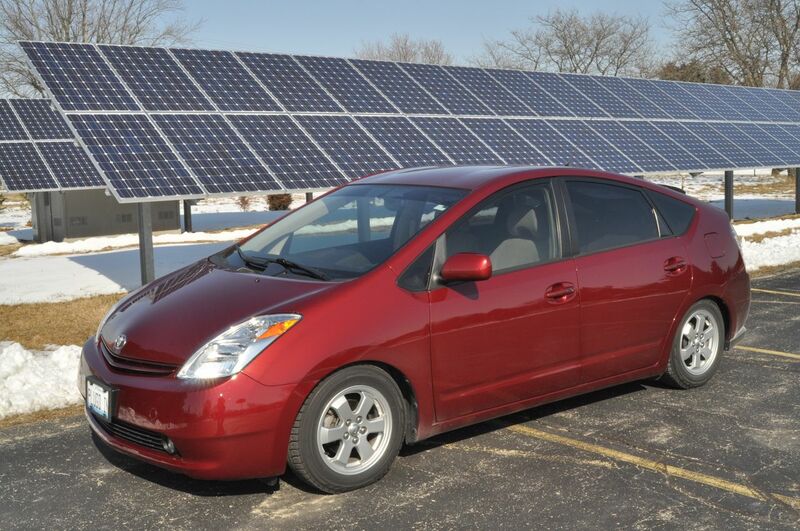 After that, it dropped to being only a “normal” Prius – getting 50 mpg. When I got back home, my wife already had a note on the kitchen message board for the new Prius. I wasn’t real happy with the decal on the back of the car. It was sort of ugly and the colors didn’t match anything else on the car. I removed all of the decal, except for the small plug symbol. Charging is easy – just run an extension cord from the outlet in the garage or next to the front door to the inlet on the back of the car. It recharges at a rate of 1000 watts, and takes 5 hours for a full charge. There’s even a safety feature so that you can’t turn the car on and drive off if it’s plugged-in. The battery pack is a little over 5KW, and is designed to give you “enhanced fuel-economy” for the first 30 miles of the day. Depending on how you drive, that means over 100MPG for those first 30 miles. I’ve noticed that engine temperature makes a big difference to what the final fuel economy comes to. The car is NOT a Chevy Volt, and it is NOT the new Toyota Plug-In Prius. It has NO true EV mode, but just uses more electricity and less gasoline in general. Real-world fuel economy really depends quite a bit on weather, driving style, distance, etc. etc. The only real control the driver has over this is position of the accelerator. As it is right now, I’m still really learning how to drive the car. It’s a bit different. I would say the Hymotion Prius is a unique beast. A great manufactured car modified after-market by another manufacturer working with the first one, but still a hack, although a well done one. I’ll let you know more about the car in the future. I expect we will be going on quite a few adventures in it! Added an “EV SWITCH”. It allows the car to enter EV MODE by pulling and holding the cruise control stalk towards you for two seconds. Finally! The car has a true EV Mode! It’s limited to 100 battery amps maximum and 33 mph top speed. If you hit 34 MPH, the car reverts to “Normal Prius” mode, and the engine will start and go through its regular warm-up process. Nice, hymotion prius available no reserve this week. Former California municipality, I believe.